Tonya Cutler stands in front of the room, tapping a marker on the list of “triggers” written on a large sheet of paper taped to the wall. While one of the eight adolescents in the room paces relentlessly around the perimeter, his ears picking up everything she says, two girls seem to ignore her, passing cards back and forth. A second boy lounges prone on a stack of gym mats; a third interrupts constantly with questions. Slowly, the teens offer answers. The simple exercise on triggers and consequences of drug and alcohol use with teens in the Natchaug Hospital residential program is one way Cutler, the facility’s first recovery support specialist (RSS), helps clients. 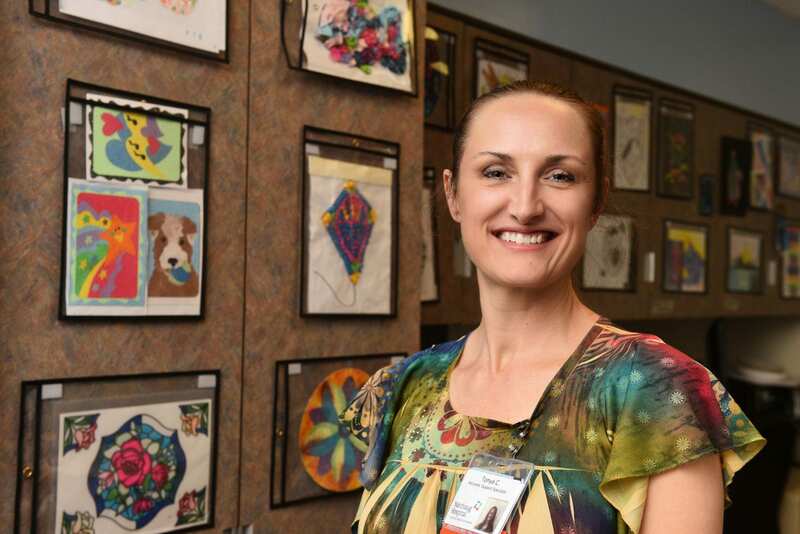 The 45-year-old Colchester resident started part-time inpatient at the Institute of Living about two years ago, moving to the outpatient setting at Rushford before Natchaug created her inpatient position. While Hartford HealthCare introduced recovery coaches in emergency rooms to help people overdosing, the RSS supports people struggling with recovery and mental health issues, as someone who understands from experience. “The RSS is in recovery, too,” says Cutler, who was diagnosed with anxiety, depression, post-traumatic stress disorder and bipolar disorder, and used pain medication and cocaine to cope with her diagnoses and chronic physical and emotional pain before going to Rushford’s Medication Assisted Treatment Close to Home in Glastonbury. Cutler embraced treatment and “worked hard at seeing where it stems from” emotionally. She was speaking at Rushford programs and serving on its Client and Family Advisory Council when a staff member suggested she become RSS-certified. “The clients need people who can relate to and understand what they’re going through,” she says of the 80-hour state certification through Recovery University, which led her back to Rushford first as a volunteer and then an employee. “It’s the best of both worlds – they get medical experience from the doctors and ‘lived’ experience from me. This was the most important factor in instituting the RSS position, according to Behavioral Health Network President Patricia Rehmer. The mother of three and grandmother of one finds her new vocation a way to channel the trouble she’s faced. She also understands how alienating recovery can feel. Slight with bright eyes, a pony tail and a whimsical mustache tattooed on her right index finger – “See?” she says, putting her finger under her nose. “It’s fun!” – Cutler says she gets as much out of her work as clients at Natchaug. For more information on services at Natchaug Hospital, click here.